Delectable Italian deliciousness in a snap!! This meal is easy to make, in about 30 to 40 minutes. Before we get started let’s see what the nutritional benefits of this pasta dish is. 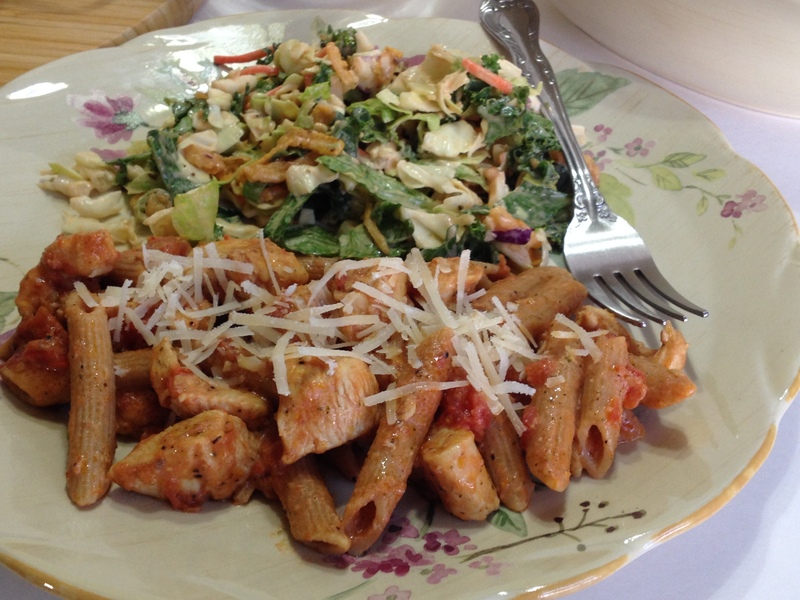 Whole wheat Penne pasta is called for in this recipe. The whole wheat or brown pasta retains the fiber of the wheat flour. Therefore making the pasta a complex carbohydrate, not a simple carbohydrate like the traditional pastas with the fiber removed before being ground to flour. Complex carbohydrates digest slower, leaving you to feel full longer, giving more energy and controlling your blood sugar levels. This is great for diabetics. A serving of Chicken (3 oz) provides 65% of your daily need of protein. The recipe also uses flaked sun-dried tomatoes, but before they are processed, one cup of sun-dried tomatoes provides 7.6 grams of protein, 1.6 grams of fat, and 6.6 grams of dietary fiber, which is equal to 27% of your daily need for fiber. Sun-dried tomatoes serve as an excellent source of minerals, including potassium and magnesium. They also are filled with vitamins K and niacin a B vitamin. Vitamin K helps with blood clotting and wound healing and niacin is good for brain function (source for sun-dried tomatoes: Livestrong). Here are the step by step instructions with complete recipe to follow. 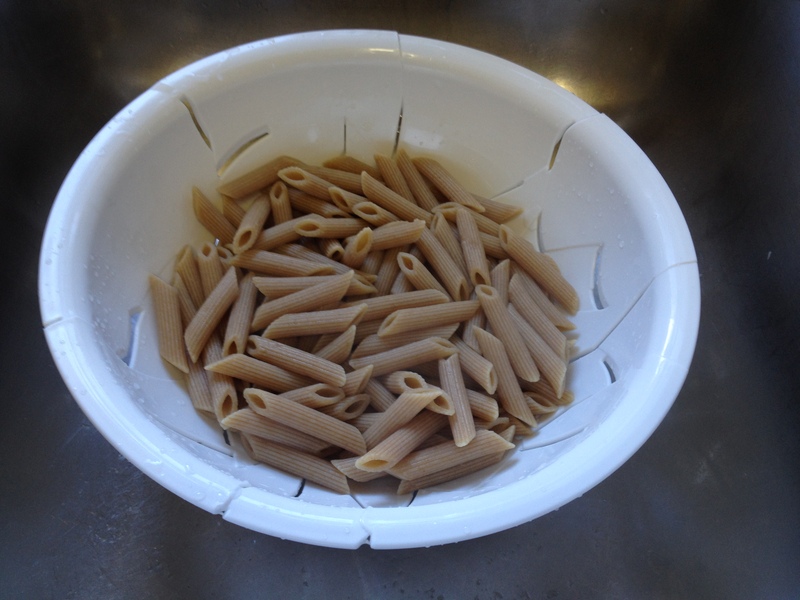 Cook 2 cups of whole wheat Penne pasta according to directions on package. Drain well, set aside. Mix spices, including corn starch or arrowroot in a small bowl, set aside. If you have allergies to corn than you can use arrowroot starch. You will find this starch in your local Whole Foods Market or other local health food store. Also, you may not find flaked or powdered sun-dried tomatoes. Just buy whole dried sun-dried tomatoes and place one or two small dried tomatoes in a food processor and process to flakes or powder. It is your preference. Melt 2 tablespoons of unsalted butter in large skillet on medium-high heat. Add chopped chicken, cook and stir 5 minutes or until lightly browned, or no pink is present and the meat is oblique in color. Next add spices, 1 14.5 oz. can of petite tomatoes undrained, 1 cup of cream cream and 1/2 cup of fresh grated Parmesan- Rigatino cheese. Mix in; bring to a boil, stirring constantly until well blended and starts to thicken some. Reduce heat to low; simmer 5 minutes. Stir in pasta and toss gently to coat; cover and let stand with heat off for 5 minutes. Plate and serve with additional Parmesan cheese, if desired. Cook pasta according to directions on package. Drain well, set aside. Mix spices, including corn starch in a small bowl, set aside. Melt butter in large skillet on medium-high heat. Add chopped chicken; cook and stir 5 minutes or until lightly browned, seeing no pink in the meat. Next add spices, tomatoes, cream and cheese. Mix in; bring to boil, stirring constantly until well blended and starts to thicken some. Reduce heat to low; simmer 5 minutes. 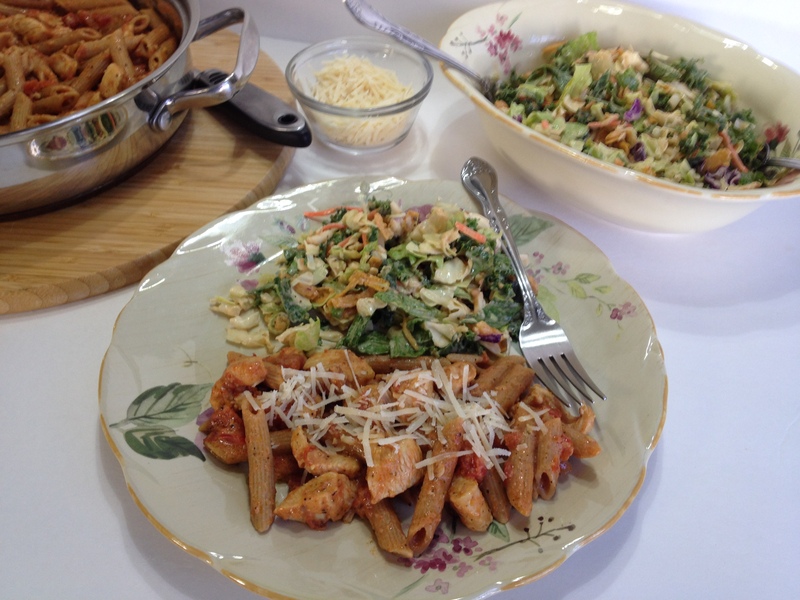 This entry was posted in Chicken, Main Dish, Pasta and tagged Barbecue chicken, Cook, Dietary fiber, Garlic powder, Parmigiano-Reggiano, Pasta, Penne, Penne pasta, Sun-dried tomato, sun-dried tomatoes. Bookmark the permalink. Delicious pasta dish. Perfect for Father’s Day. Glad you stopped by. Have a great weekend!